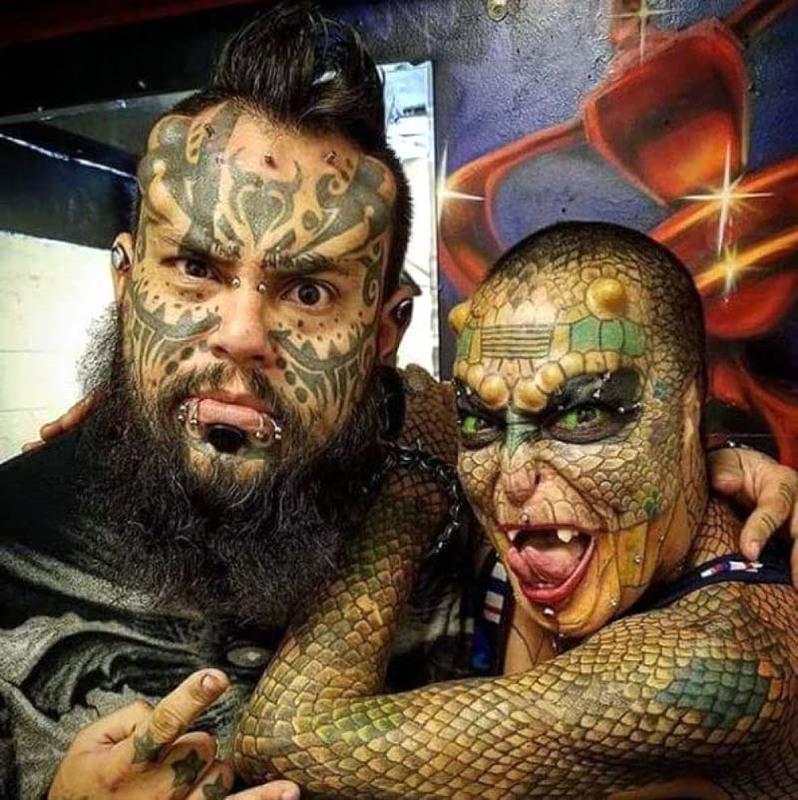 In this weird, modern world we live in, it seems that pretty much any sort of body modification can be achieved if you've got the money for it. A lot of people who seek out cosmetic surgery go down the more conventional routes (if it is possible for plastic surgery to be "conventional" in any way), enhancing their breasts, butts or whatever else they think will up their attractiveness - but there are a few who opt for the stranger side of bodily transformations. Eva Tiamat Medusa, a woman from Bruni, Texas, quit her job as the vice president of a bank several years ago in order to pursue her dream of living her life as a dragon. She made the decision after being diagnosed with HIV, which for her was a wake-up call that she wasn't living her life in the way she wanted to. Now, after $60,000, she looks completely different - and she's so much happier for it. Describing all the procedures she's had done, Eva said: "I have eight horns on my forehead; I have had my ears removed; my nose reshaped; most of my teeth removed; I’ve had the white-part of my eyes stained; my tongue bifurcated; my whole face is tattooed and I’ve had some scarification and branding on my chest and wrist." But her decision to become a dragon was not at all sudden. 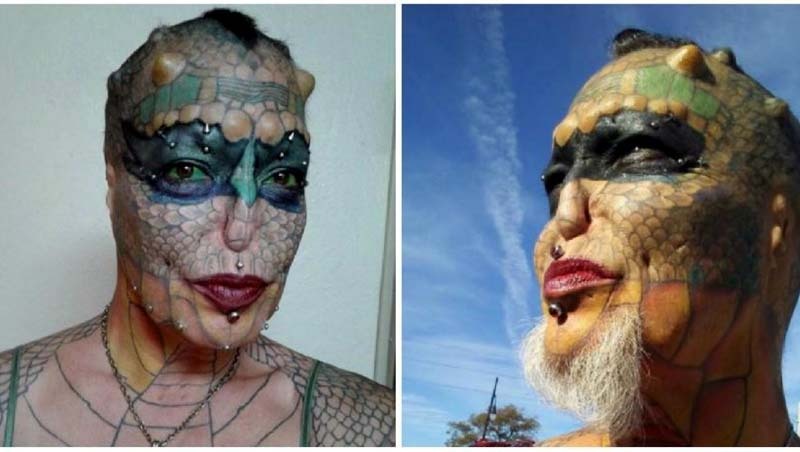 In fact, she claims that she's felt connected to the reptilian form ever since she was abandoned by her parents at the age of five, and was subsequently "born again" into a family of western diamondback rattlesnakes. "I have two mothers: One is my original birth mother and my second birth is to my reptilian parents, which are the rattlesnakes," she said. And, despite what others might say, the so-called Dragon Lady is committed to her lizardlike looks. "For me, my transformation is the greatest journey of my life," Eva said. "There are profound reasons and deep meanings about my transformation and why I’m doing it." "I hope that my story will help other people – not only those who have gone through hard times, but also people who have lost hope. "I myself know what it’s like to be at that point. Before my transformation I was vice president of one of the largest banks in the U.S. and I left when because I became HIV positive and feared I was going to die. My big thing though was I didn’t want to die in this world looking like a human." But Eva doesn't just look like a dragon - she truly believes that she is one. "As much awesomeness and goodness there is in humans, compared to other species they are the most destructive and hateful. I decided at that time, that it was time for a change in my life, so I wanted to look like something that wasn’t human." Despite how different she may look to other people, Eva is still just about as "normal" as a person can get. She has three dogs and a cat, whom she shares her home with, enjoys cooking, and posts loads of selfies to Instagram. Sure, she might also have a forked tongue and horns - but everyone's got their quirks, right?